So now that summer is in full swing, I decided to lighten up on the makeup. I wear makeup pretty much everyday. And with the whole “no-makeup” makeup look that’s becoming popular, I decided to put my regular foundation aside for something feather-weight light in texture. I really wanted to try a cleaner foundation/tinted moisturizer for myself, but I’ve been hard pressed to find a clean foundation that would match my skin tone without having to mix foundations. So I ended up trying two of the newest MAC foundation offerings, like the Studio Waterweight SPF 30 and Pro Longwear Nourishing Waterproof Foundations. My shade in MAC foundations is NC50 and depending on the formula, I will mix in a bit of NW45 because I can be hard to match sometimes. But with both of these shades, I can stick with NC50. Anyway, both foundations are good options to transition into a lighter texture. The Studio Waterweight is dispensed with a dropper, so you can control the amount needed. I found that the best way to apply this was with my usual Real Techniques foundation brush. What I did like about the coverage was that it was sheer (you can build the coverage, if desired). You could barely tell that I had anything on because it matched perfectly. It’s moisturizing and oil-free, but after wearing all day, it seemed to have broken down wear the finish didn’t look as smooth as the initial application. I did use a little bit of powder to set, but towards the end of the day, I wasn’t that impressed. But before I “poo poo” it, I will give it another shot and maybe try it with another powder and moisturizer. As far as the Pro Longwear Nourishing Waterproof Foundation, this was closer to a tinted moisturizer in terms of texture. But the difference is that not only can this product be used as a foundation, it can be used as a concealer. You could definitely build the coverage to full coverage, but on me, one application was good enough. Rather that use a brush or sponge, I decided to work the foundation with my fingers. It does a good job of covering superficial dark spots and minor imperfections and it sits beautifully on the skin. Although, it’s “watertight,” it does repel sweat, but I still had to set it with a little bit of loose powder. The NC50 was a good match and I didn’t have to mix it. I like that it gives a natural, polished finished. 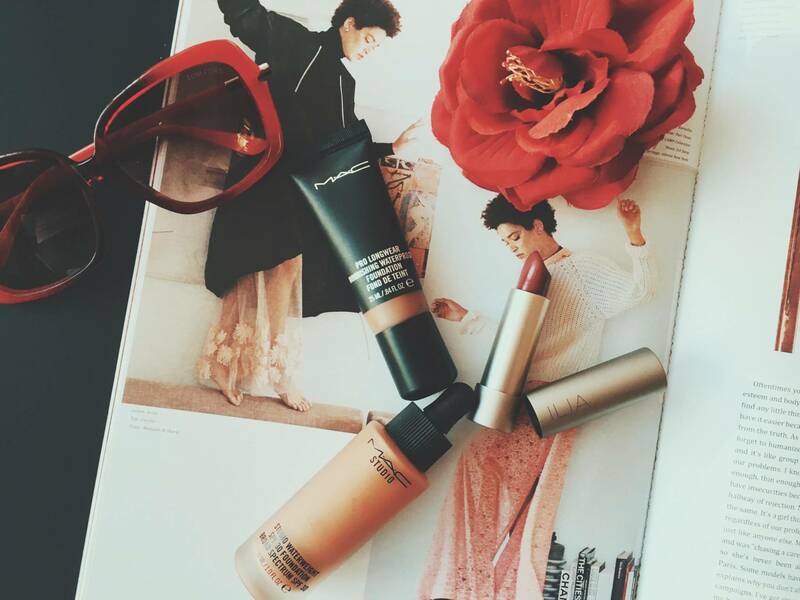 So out of the two foundations, I would definitely go with the MAC Pro Longwear Nourishing Waterproof Foundation. Since I couldn’t find a cleaner foundation to match my skin tone, I decided that I would delve into clean color makeup. Since I’ve been pairing down my makeup, lipstick has been my “go-to” for color. I’ve seen ILIA makeup for a while, but never tried it until now. This green beauty brand has a beautiful line of makeup and I came across this gorgeous lipstick called “Lust for Life” that’s like a soft mulberry that would look great on any skin tone in any season. More of a tinted lip balm in texture, this color imparts a soft sheen while it conditions the lips with beeswax, sunflower oil, cocoa butter, and shea butter. I am still looking for a green beauty foundation that will match my complexion perfectly. So the quest is on! Previous Post Can You Realistically Wear The “No Makeup” Look?